Out of all the portable photo printers we review on our site we have to say these two may be our favourites, both are super portable easy to use and look great. 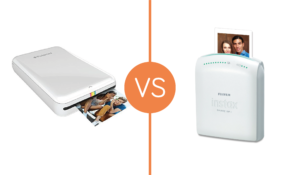 So we thought we’d put together a comparison of the polaroid zip vs fujifilm instax to help you pick from these two great portable photo printers. Both as we’ve said are portable and easy to take anywhere. The Zip can be easily put into the pockets of most trousers or jackets, where as the Instax is slightly larger as you’d need a small bag or larger jacket pocket to carry it with you. The Instax measures at 4″ x 1.6″ x 4.8″ and the Zip is 2.9″ x 0.9″ x 4.7″ (width, depth and height). The Zip is the smaller of the two, and it could be argued that the look of the Zip is slightly better than the Instax, looking slightly sleeker like a small USB device. So that’s 1-0 to the Polaroid Zip. Okay so next up battery power. The Fujifilm Instax uses two lithium CR2 3V batteries which provide up to 100 prints. So if you’re out and about taking pictures and printing then take extra batteries as no-one wants to run out of juice mid project. You can also power the Fujifilm Instax bu AC adapter which needs to be purchased separately, although this goes against the point of being a portable photo printer, it could be handy when you’re printing at home. The polaroid Zip and the other hand has a rechargeable battery that can take up to an hour and a half to fully charge and once charged it can print 25 prints. The portable photo printer charges by a micro-USB port, a handy trick is the printer still works while charging so taking an extra portable battery back up such as the Anker PowerCore+ you can easily charge it while you’re out and about. This ones a tough one on where to give the point, the ease of use of the Fujifilm Instax to just take extra batteries but then the rechargeable battery in the Polaroid Zip makes it a more portable option. A point each on this so 2-1 the Zip so far in our Polaroid Zip vs Fujifilm Instax comparison. Both printers work in different ways. But they both print great looking snaps. The Instax gives you more true to life colour and has a softer look with a retro glow which is very similar to old instant pictures. The Zip gives a crisper print, but the colours are more saturated and darker than the Instax. Both print on similar size paper but the Zip’s image is bigger as it takes up the full site of the paper, where as the Instax has a white boarder (this could be a plus if thats the style of print you are looking for). The Zip paper also has a sticky back, so it can be used as a sticker if you remove the backing. Another close call with the colour of the Instax is better, but the texture, size and sticker ability of the prints from the Zip just winning. 3-1 Zip. Okay next, the time it takes to print. The Instax can print in around 16 seconds and takes four minutes to develop (if you want something faster check out the Instax Share SP-2 when its released). The Zip takes just over a minute to print but the photo is completely developed. This one is tough, I think we’ll give it to both, as the speed the Instax prints is great as long as you can wait for it to develop. 4-2 Zip. So there you have it the final score in our Polaroid Zip vs Fujifilm Instax comparison is 4-2 to the Polaroid Zip. Although we have voted the Polaroid Zip the better portable photo printer, you really can’t go wrong with either of these two, both the Polaroid Zip and Fujifilm Instax are great fun and are super portable. 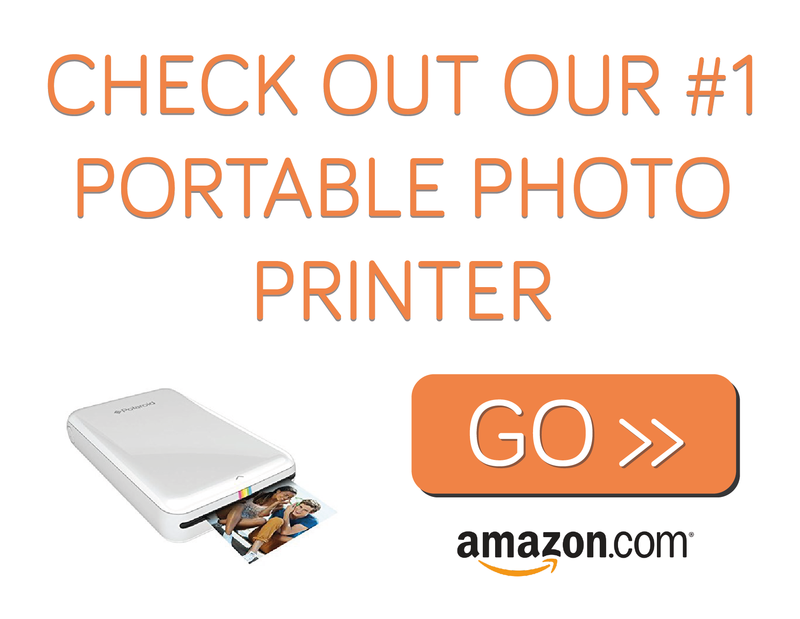 Making it easy with either of these printers to snap a picture, edit and print on the go.